Today’s Final Jeopardy answer and question (Primetime TV Actresses), the December 8, 2017 game between Ben Raphel, Laura Miller, and 4-day champion Kyle Becker. 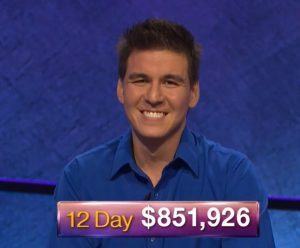 Today’s Final Jeopardy answer and question (TIME Magazine’s Person of the Year), the December 7, 2017 game between Joe Gaspard, Katia Noll, and 3-day champion Kyle Becker. Today’s Final Jeopardy answer and question (Reference Books), the December 6, 2017 game between Eric Dravland, Lindsay Norsworthy, and 2-day champion Kyle Becker. Today’s Final Jeopardy answer and question (19th Century Europe), the December 5, 2017 game between Kimberly Kist, Matthias Clark, and 1-day champion Kyle Becker. Today’s Final Jeopardy answer and question (Children’s Books), the December 4, 2017 game between Kyle Becker, Alice Pelletier, and 1-day champion Lisa Kristina.